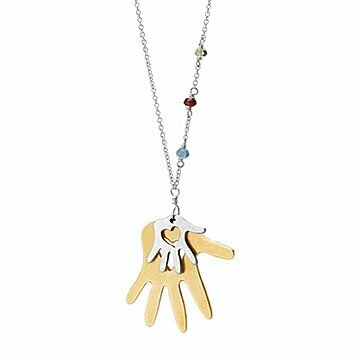 A bronze hand holds a tiny sterling silver one to represent the bond between a mother and her children. Mothers are miraculous, showing up to take our hand just when we need them. Britta Ambauen's sterling silver and bronze pendant is an artistic interpretation of the remarkable bond between mom and child. She handcrafts the piece, etching miniature hearts into each palm and adding birthstone gems to represent your children. Give the sentimental piece to a mother, so that even when she can't hold her children's hands, she can carry them with her always. 18-inch sterling silver chain. Handmade in Seattle, Washington. Beautiful necklace. She loved it! I am disappointed in this necklace. Not worth the price! She will probably wear this everyday as a reminder of her daughter. It would be nice if this was also offered in a 20 inch length. I think the necklace would look pretty with different necklines. Looks beautiful and is very meaningful for my wife as a Mother's day gift. The chain is a little fragile for a mom who is holding infants. It broke the first time my daughter-in-law wore it. The baby grabbed it, and it's so delicate it brike with a single tug. Great item for new Mom! I wish the gems were 2x larger. Gift for my daughters birthday to celebrate her as well as her child.